This blog develops one of JoeAm’s new principles aimed at figuring out how to invigorate the Philippine economy and enhance the well-being of the nation’s peoples. Principle 7: Regulations must be for the nation, not for the good old boys. good old boy (noun): a man who embodies some or all of the qualities considered characteristic of many white men of the southern US, including an unpretentious, convivial manner, conservative or intolerant attitudes, and a strong sense of fellowship with and loyalty to other members of his peer group.
. . . and them good old boys were drinkin’ whiskey and rye . . . I reckon they had no tuba. The POINT of the expression is that the collective of Philippine power-brokers, populated by dynastic barons and well-heeled oligarchs, represents a closed and entitled society – a bunch of good old boys – that breeds within its own ranks, both figuratively and literally, and often places higher value on favors between its members than service to the people. That’s essentially how the pork scam grew to be so huge and pervasive: acceptance of favors as a way of life for government officials. There are many examples of regulators being close to regulated institutions, and even being drawn from the industry being regulated. The friendly co-existence was called to my attention by a brief article the other day, innocuous to most if I read the lack of comment correctly. The article dealt with liberalized permissions granted to banks by the Philippine Central Bank in terms of hours of operation. Previously, banks has to apply to the PSB to get permission to change their hours of operation. Under the new rules, Banks can change hours at their own discretion. The BSP rationalized this as being in the customer interest, suggesting that now banks can operate longer hours if they choose. Provide more and better service. Now that would be fine if banking in the Philippines were a competitive business, but it is not. It is a captured, collusive profit machine, a vehicle for the good old boy, entitled elite. The new rules allow banks greater leeway to do what they please. Banks in the Philippines are not in business to serve customers, but to use them. It harkens back to the U.S. in the 1960’s when banks were regulated money machines, not a competitive service industry. Philippine banks borrow money from consumers (their deposits) at 0.5% per year or less and lend it back at 12% or more. A moron could make money with that kind of spread. When a crisis hits (Typhoon Yolanda), banks close their doors rather than work with passion and precision to get money into the community so people can get back on their feet. When people are back on their feet, THEN banks open up for business. The Central Bank evidently is fine with this. 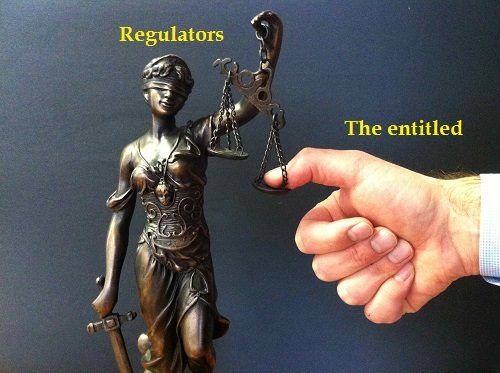 When you think of why regulatory bodies are needed, it is because there are drivers in the business community that, left uncontrolled, would take advantage of consumers. If you imagine a huge scale with businesses on one platform and consumers on the other, the regulatory body ought to be the institution making sure that the balance is maintained properly. Neither businesses nor consumers should be able to unduly take advantage of the other group. But the scale in the Philippines has a huge thumb on it. It is the incestuous relationship between big business and government lawmakers and regulators, a good old boy network so huge and onerous that Filipino consumers are squashed under the weight of it. They are pawns, to be used and abused for the profit of the good old boys. You say you don’t like Manila’s electricity rates? You wonder as to the breakdown of train services? You wonder how building codes can be so so loose that people get washed down river with the logs? You wonder why Manny Pacquiao fight replays on free television are so stuffed with commercials that it takes three hours to show a 47 minute fight? You wonder why broadband services are so unreliable and slow? You wonder why government agencies treat you rudely? Regulators either don’t exist or they favor the oligarchs. And lawmakers running for office are not funded by consumers, so why give them any priority? Precious little regulatory weight comes from the people. There is no private Civil Liberties Union or Consumers Union to tilt the scale back. There are no class action lawsuits when large numbers of people are harmed by corporate or government deeds. And yet it is the broad health and well-being of the people that is the key to the health and well-being of the nation. Philippine leaders miss – and have missed for a great many years – the concept of what democracy means in terms of how it it is supposed to power advancement and enrichment. There is a blindness about the dynamics of a PEOPLE in action and how they – the people – can drive a nation forward. Missing is the idea that the people are there, not to be USED, but to be empowered to assure economic and social change, and economic and social GAIN. Instead we (the collective nation) leave it to the oligarchs and their incestuous buddies in government to drive the nation forward. We don’t have true freedom of speech to assure the PEOPLE can shout if they want to. Media are self-regulated, run by the oligarchs with no consumer checks and balances and no regulatory mandate for public service programs or sensitivity to good values. Owners of cellular service companies have a tin ear – a fake, puffed up, showy, shallow idea – about consumer well-being. Government leaders have no idea how to energize technically skilled Filipinos so they can communicate and create and innovate like competitive nations do. The Philippines is a nation unplugged. And there are no organizations that press class action law-suits to penalize cellular service companies monetarily for failure to live up to acceptable standards of modern connectivity. Libel is a criminal offense with a presumption of guilt. What an affront to the idea that opinions matter, even if they are harsh. Opinions are the energy for change. Bank secrecy laws protect well-to-do thieves and allow them to hide their ill-gotten wealth. That the former Chief Justice of the Supreme Court hid millions is an indictment of the paucity of values held by the empowered few. No wonder doctors and lawyers and others don’t pay their taxes. The good old boys set the pace for cheating and hiding. And the ordinary people are stuck with the burden. The absence of FOI hides important information from the people. As if the people were the enemy and State secrets should not be revealed to them. Government workers snarl at the people who pay their salaries. Or extract small denomination bribes. Regulators impose ridiculous burdens on consumers, like the LTO’s license plate replacement boondoggle or the agency’s mandate that vision checks be done outside the LTO, another line for citizens to stand in and another set of fees to pay. What, LTO offices can’t put a piece of cardboard on the wall with letters on it and draw a line on the floor 20 feet away? You know, the idea of providing SERVICE to citizens rather than a runaround? Like banking when officials sit back, branch offices closed, and whistle as devastated communities are starved of the money they need to get quickly back onto their feet. Like gasoline providers who park their trucks and let devastated communities freeze up without fuel. Like cellular services operators who seem not to grasp that their services are what people desperately need to deal with emergencies. So recovery is slow. The oligarchs toss out no lifelines to the people. Consider the process, the mechanisms, the dynamics. What energizes democracy and promotes the development of a healthy economy and healthy people? Intelligent voices treated respectfully, even if they disagree. It is the energy of change. Good information. It is the foundation of good thinking. The ability to communicate at modern speed. It sets or limits the speed of change and the speed of innovation. The ability to punish those who would choose to penalize the nation for personal gain. We need a consumer regulator charged with regulating the regulators. The good old boys must be forced to listen to the people during the working year, between elections. They will not change on their own because there are too many advantages to bank secrecy and suppression of speech and established ways of passing the buck. Or stealing it. The courts are hopelessly ensnared in rat’s nest process and delays that render impotent the idea of swift punishment of those who hurt others. ESPECIALLY if it is a good old boy who is doing the hurting of others. The PEOPLE need to be empowered, given a voice, given the ability to punish, given the ability to protect their own. Congress has failed at this role. It is a part of the good old boy network. The House is a pack of rabble that has the collective intellectual lawmaking wisdom of an unschooled boxer and a deposed dictator’s wife. The Senate is a House of Lords of grand distinction and self absorption . . . and little pragmatic initiative. Can you imagine? The Senate Ethics Committee has not even acted on the whole pork matter. It has stood silent. That is the ethic, then, isn’t it? The REAL ethic of the good old boy network. Silence to bad deeds. The nation needs a Peoples’ Ombudsman. A new ethical imperative that represents citizens properly. Write it into the Constitution. This independent person or body should have the POWER to audit, censure and punish lawmakers and regulators who are not doing their job protecting and promoting consumer interests. Furthermore, the Peoples’ Ombudsman can set a legislative agenda each year, publish it, and track progress toward its achievement. Revise bank secrecy laws to permit the Department of Justice to access banking records under proper court warrant. Establish a regulatory body for popular media (radio, television and newspapers) with consumer representatives included on the regulatory panel. Establish an independent regulator of cellular service providers. A law establishing a lifeline services distinction for gasoline, banking and cellular service providers to aid in quick recovery from disasters. Suit against the LTO and NBI for failure to provide courteous and timely service when consumers are required, under law, to obtain licenses or clearances. Suit against cellular service providers for failing to meet advertised claims for network access and speed. Arm the consumer with power and this nation will modernize mighty fast. The economy will boom. Citizens will be cared for properly by the State and by private companies that provide essential services. REAL power to the people, eh? Take care of the citizens. May I add this onerous restriction that cell phone companies impose on consumers: the inability to unlock a phone from its exclusive provider when its subscription plan expires. Unlocking the phone should be mandatory, just like in the US. It is all a reflection on the inherent weakness of governance. Where are the Filipino Ralph Naders, Teddy Roosevelts? So added. Exactly the kind of rebalance needed. The phone company operators are the biggest scam artists in the Philippines . . . well, next to the Congress, that is . . .
I’m not sure but as someone who has lived in the Philippines and then moved to the US, I find US telecom more “stiffling” when it comes to unlocked phones. Unless, it has changed in the couple of years that shops where you can get phones unlocked are out of business? To make things worse for US consumers, big companies are starting to buy the smaller and newer companies in the game. Where to begin, Joe? ALL points brought up seem to be pie-in-the-sky “consummations devoutly to be wished.” The current scandals and pressing executive actions across the board in the national arena are showing these discrepancies between ideals and realities. On one hand there are the top-down actions from the 3 branches of the gov’t themselves to show that they are the real thing and on the other, the ground-up educated actions from the governed themselves and all points in-between to make sure that principles DO work. At this point, we as a people have to hit the ground running! You are absolutely right, Sonny. If the three branches of government simply stood up and went to work for the people, my complaints would not be necessary. I see glimpses of that once in a while, but the composite leadership failure to comprehend the penalties of no FOI, libel as a criminal offense, no anti-trust, bank secrecy as a barrier to justice, and infinite harms and runarounds assigned to ordinary people . . . they clearly don’t “get it”, as to what it means to SERVE the people. Time to stand up and shout. They are on their heels with the pork scandal and vulnerable to developing a conscience. Regulatory capture is the inevitable result of capitalism and market forces unbound. Sooner rather than later, according to capitalism and free market ideology, the smartest and the most hardworking will become dominant, thus for example not only America but the entire world ended up paying for the “mistakes” of banks too big to fail, of GM, and for a whole host of other corporations in the US and otherwise. I’m with you in the search for a way to level the playing field, at finding a balance between corporations becoming big enough to compete globally but not so big that governments are powerless against them. Where and how do we find the balance? Why do some corporations become so big that their survival becomes inseparable from the survival of a country? The courts (US and here and maybe in other countries too) are also to blame for the shift in the balance between corporations and people. If you look at lobby groups here and in the US you will see that regulators join the private sector and private sector employees become regulators. The revolving door is a reality and the only safeguard I have seen is in the US where a regulator turned private sector player is allowed to lobby only after a certain span of time. But that is not enough because knowledge and expertise is not time bound. From actual experience, the Philippines used to have as garments technical consultant and lobbyist the man who wrote the book on US regulations regarding garment exports and imports, the bible of that industry. Class actions suits etc are good but they only address symptoms, they happen as a result of a specific pain experienced by a certain sector or class at the hands of a corporation. Let us look to address the underlying causes. Did we create a frankenstein when we gave corporations the full rights and privileges of persons but with limited liability? A bank, a manufacturing conglomerate can go bankrupt but the owners or principal stockholders do not necessarily go down with their company. And majority control comes not from owning shares directly but through layers of corporations where when added up a certain principal or group ends up with control. They then appoint themselves as executives and/or board members in those interlocking companies. When those companies go bankrupt, it is usually the small investors left holding the bag. The executives, the board, unless there is a clear case of criminal wrongdoing get away scot free and rich. We have seen this time and again. Recently, in the US, SCOTUS ruled that campaign contributions by corps are protected by free speech. Well at least the issue has been discussed over there, we do not even talk about it here. So you have the anomalous arrangement where huge Philippine corporations are allowed ownership of tri-media and at the same time to engage directly in the businesses of public utilities, transpo, infrastructure etc. Same thing in the US, defense contractors used to own one or more of the three networks. How then do you rein them in when they have one hand in your pocket and the other gagging your mouth? There oughtabe a change. How is the question because the case you are bringing up is the collusion of government and regulators versus the public, the consumer. Regulatory capture, how do you break it. Maybe your suggestion, which sounds to me like a bigger and more sophisticated version of Occupy Wall Street is the answer. I think we also have to put some caveats to popularly held beliefs by adding “up to a point” to such truthiness like free markets are wisest, there is an invisible hand, corporations are job creators, etc. etc. I found myself nodding in appreciation of your eloquently nailing the related issues paragraph after paragraph. “Regulatory capture, how do you break it?” That is the big question, for sure. My proposal itself is a non-starter because the legislators would not put it on the table. I like your “Occupy Wall Street” idea because the solution is more likely to be found in the private sector. Right now, there are a lot of voices speaking, generally in groups dealing with specific issues. Someone needs to organize the voices – the trees – into a forest, an organization with bylaws and growing membership that has an umbrella purpose – get government regulation and acts on the side of the people – and specific initiatives to do that. Anti-trust, FOI, poor job performance by individual legislators (Pacquiao), and so forth. Breaking up media control, for sure. I very much appreciate your experience and insights on this issue. Excellent idea. The tricks are (1) exactly how to decide when a legislator has been negligent (special “snap” election? ), and (2) how to get the existing pack of negligent rabble to pass such a law (citizens’s initiative?). Without question, if the Ethics Committee is not willing to censure those indicted for plunder as a negative reflection on the Senate and nation, the people should be given the opportunity to speak BETWEEN elections and throw the bums out so they stop the incessant use of privilege speeches for personal matters on TAXPAYER time and in TAXPAYER premises. Sorry I have not been in contact for a while. I really appreciate your very detailed and thoroughly researched blogs. A number of points. I feel that the Philippines is on a cross roads. It has the potential to jump forward and join the other elite countries in the Asia Pacific area. I have read a number of international accounts that indicate this is possible. Yes, as you report states there are a number of “issues”. But I feel there is a growing consciousness here about all of this. Yes, it seems everything takes forever, and the pace is at “pinoy time”. The country knows it is in competition with the rest of South East Asia and has to adjust. . The stats either put the Philippines near the top or at the bottom in this region, very pinoy and crazy crazy. The general feeling is positive I feel. I get terminally depressed reading the news and blogging on the Guardian UK. As for the House of Lords you are broadly correct. It revises bills that are sent to it by the Commons. It can return a bill for a second reading. It does not have the power to create a bill. There are hereditary Peers. So may be the direct decedent of the illegitimate child shirred by Charles II. There are now life peers. One example is Mrs Philip, a West Indian lady, the mother of Stephen Philips brutally murdered by white racists some 20 years ago. The composition is the same as that of the middle ages but now there are not only Anglican Bishops, but Catholics, Hindus, Muslims Jewish and Sheikh religious leaders. i kind of like this development. One chamber of the wise being elected individually with the other chamber being dominated by the arid British political parties. The Queen is a figure head, but the ultimate power lies with her. Yes, illogical, but it has worked fairly well for many years and will evolve, I hope to reflect a changing world. I like the German and Irish systems too with Presidents as figure heads. The all powerful President which is the US, French and Philippines system I still find a bit disquieting. I am from a different culture. This is something we need to remember here in the Philippines. Every where has its own evolved systems. Yes get them to work better and be more representative and open. But you have to work with the grain where ever you are. Thanks for your comment, Jonathan, which I read with great interest. I particularly appreciate your recognition at the beginning that the Philippines is moving into a leadership role in Asia, and at the end, that the Philippines is what it is, and need not be anything else, but it would benefit if a few things worked better. To the first point, you must have been reading my mind. I’m outlining a schedule for my future blogs and one of them is entitled “How the Philippines can lead Asia forward”. Sound economic growth is a leverage to that, along with the firm, law-based response to China, the esteem of being backed solidly by the U.S., Australia and Japan, building infrastructure, getting rid of thieves and the culture of corruption – basically moving forthrightly into the new “Era of Asia” as a pioneer. To continue this, some things have to be done, and I’ll recite what I think they are. Fundamentally, I like what is going on. In the power sector, non-stock non-profit electric cooperatives are just going about doing the “RIGHT THING” by aggregating and bringing in low cost power into Luzon. Hopefully elevate it to a shame campaign against MERALCO and other large utilities as they continue to fail in bring down power cost even when they control the lion’s share of power demand. Perhaps this is one type of collective action that we need to do across the sectors against the good old boys. In any case, reforms concerning regulation will require one or more type of collective action from the consumers/stakeholders. Thanks for the link, wjarko. I missed reading the article until now. Indeed, the electric cooperatives, by banding together, exerted considerable influence. That’s EXACTLY what consumers need to do. Really, the peoples Ombusdman is a mighty consumers weapon. That will only be possible when the current Pres Noy establish it while in Power. The Peoples Ombudsman shall be the manager linking among different consumer such as cell phones, clearances, certification and other requirements. As you can see, in India Instrument Engineers are chartered or Listed even without a board exam. But the PRC has no regulation for Instrument Engineers, it is so sad for me, even though I got BSEE undergraduated at 5th year due to loss of income during my student time. Due to my inner talent to solved logic problems, I was hired as Instrument designeionrumentatr. I got diploma via on line under EIT. That diploma I got from EIT is for Instrument Engineer for Oil and gas, yet I could not register in CHED or PRC since Instrumentation in not regulated…see this simple thing? If PRC or CHED provided me an equivalence, then my work with my company would be with Philippine backing. As of now, most Filipino expats are doing on their own, enriching themselves with their inner talents without or less back-up from Government. If ever the Peoples Ombudsman is establish, with open line 24/7 whom any consumer can call and ask for help, then Philippine will surely fly fast to progression. For now the lines or emails for institution like PRC or CHED, nobody reply, those contact numbers and email addresses are just to show they have links but no actual services, damn to these useless government institution. Not having e-mail and phone access, and failure to respond, ought to be criminal acts. You characterize exactly the kind of power that would balance the scales so that consumers are not pawns to economic autocrats.